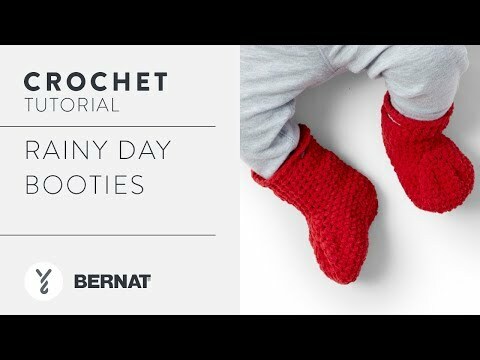 Bernat Rainy Day Crochet Booties, Red - 6-12 mos. Super snuggly, soft and cozy slippers for your favorite little one. Select Size 6-12 mos. 18-24 mos. Crochet super cozy, soft slipper like booties using Bernat Baby Blanket Tiny, a machine washable yarn that’s great for babies! While working in the round these baby booties are easy to crochet using a combination of single, half double and double crochet stitches.